Democratic Virginia Gov. Ralph Northam is under intense pressure to resign his office in the wake of the publication of a racist photo that appeared in his medical school yearbook. And most Virginia Democratic leaders and groups have called for him to resign. But if you’re surprised by these calls for Northam’s resignation, you haven’t paid attention to how the Democratic Party has changed in recent years. 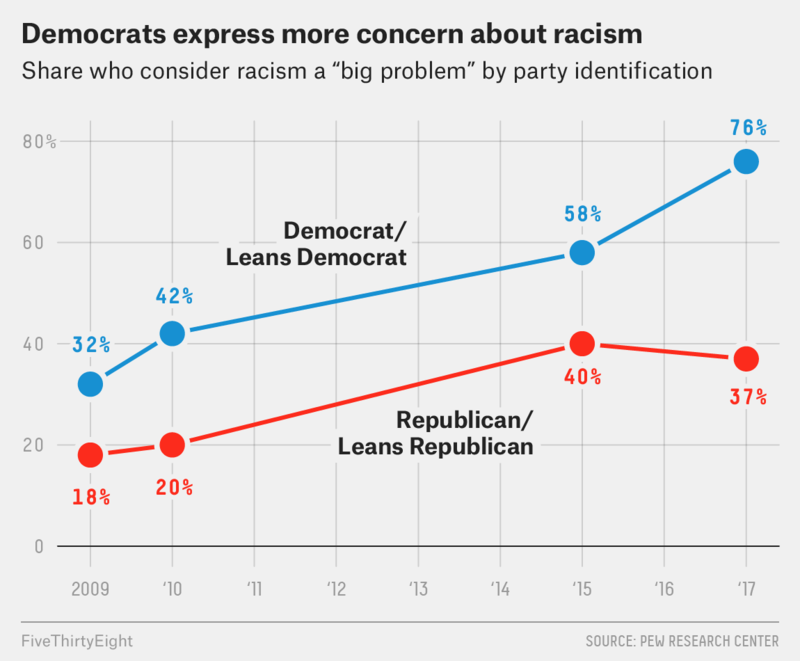 The share of Democrats — in particular, white Democrats — who think racism is a big problem has been steadily increasing and the response to Northam exemplifies the party’s shift on issues of race. 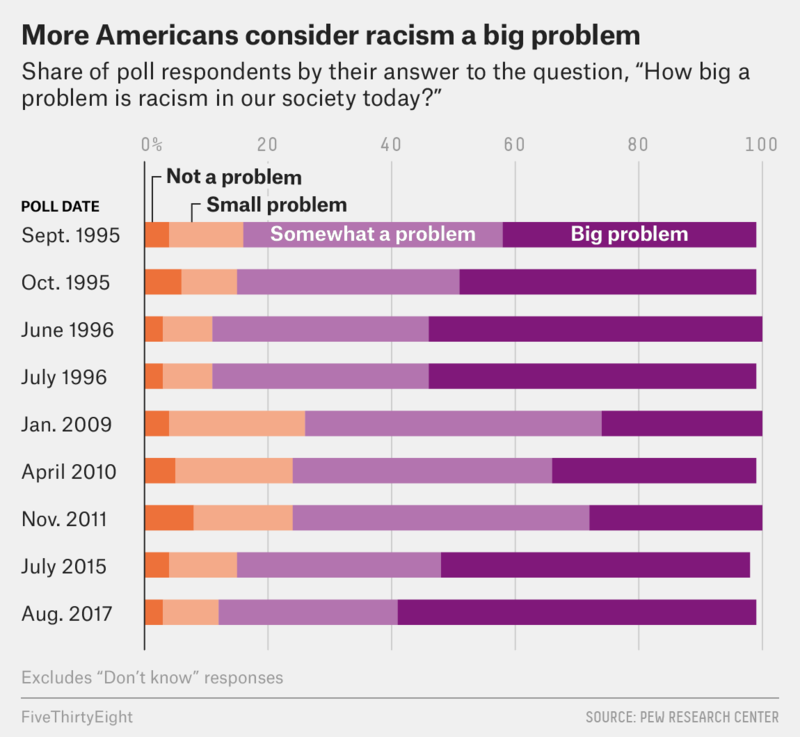 The partisan gap widened even as more Americans overall viewed racism as a “big problem” — 58 percent, according to Pew’s 2017 survey. Following Barack Obama’s groundbreaking presidential victory in 2008, Americans showed less concern over the issue. But many events — including the 2012 killing of Trayvon Martin and subsequent acquittal of his shooter; the 2014 police shooting, protests and riots in Ferguson, Missouri; and the 2015 murder of black churchgoers in Charleston, South Carolina, by a white supremacist, and South Carolina’s subsequent decision to remove the Confederate flag from its statehouse grounds — likely helped bring concerns about racism back to the forefront. And it’s no coincidence that the divide between Democrats and Republicans over racism is bigger than ever under President Trump. A 2018 poll from Pew found that only 17 percent of Democrats2 felt that Trump had a “great deal” or “fair amount” of respect for blacks, and just 11 percent felt he had respect for Hispanics. Republicans3 felt Trump had much higher levels of respect for these groups — 84 percent said he respected blacks, while 75 percent said the same for Hispanics. What’s happening here is that white Democrats have become more liberal on racial matters. A 2017 Pew study showed that views among white and black Democrats were closer in agreement over the idea that changes need to be made to give black Americans equal rights — 90 percent of black Democrats versus 80 percent of white Democrats.4 One study also found that racial resentment among Democrats fell across all age groups between 2011 and 2016, especially among younger Democrats. Gallup polling data shows the same thing, finding that, by the end of Obama’s time in office, racial resentment had dropped among Democrats while Republican views remained relatively unchanged. Should Northam resign, Lt. Gov. Justin Fairfax — a Democrat and African American — would take over as governor. This fact surely makes it easier for Democrats to call for Northam’s resignation, as it’s possible that partisan concerns would outweigh worries about racism, at least among some Democrats. After all, we’ve already seen evidence of that among some Republicans with the #MeToo movement. But at this point, one thing is clear: Democrats’ increasingly liberal views on race have made them less willing to accept racism in any form among their own representatives — Northam’s net approval among Virginia Democrats dropped almost 40 points practically overnight.